Super Week is 10 days of awesome geek events around NYC starting on October 3rd leading up to the holy grail, New York Comic Con. Kicking off the jam-packed week of awesomeness, is a LIVE show of the popular podcast, StarTalk at the Manhattan Center Hammerstein Ballroom. Hosted by astrophysicist and Hayden Planetarium director Neil deGrasse Tyson, and comedic co-host Eugene Mirman, StarTalk brings together science, pop culture, and humor as they discuss physics, astronomy, and everything else regarding life in the universe with guest celebrities and scientists. Winning a Stitcher Award for the Best Science and Medicine Podcast in 2013, StarTalk radio is the first and only commercial radio program dedicated to bringing all things outer space into your ear drums. Who else to deliver such information than Neil deGrasse Tyson, who regularly appears as the top space expert on news programs and shows across the nation? Take advantage of this Super Week kick-off and see StarTalk LIVE and in person 8PM at the Hammerstein Ballroom October 3rd, and get the scoop on space travel, the Big Bang, extra-terrestrial life, the future of our Earth and the environment, and the latest, breaking news from all across the universe. 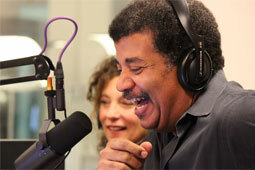 Announced guests for StarTalk LIVE! are author Malcolm Gladwell and comedian Wyatt Cenac, so amusement is sure to ensue!